Midlands Lubricants supply a range of Bearing Oils along with Circulating Oils to meet every eventuality. Below is a guideline of some of our product range uses. Midlands Lubricants also provides a comprehensive range of premium quality Bearing oils developed to meet the requirements of the latest machinery. Bearing Oils are extremely important in helping prolong the life of bearings, whilst reducing noise and maintaining speed. While most of our customers use bearing oils for automotives we also supply bearing oils for turntables and wind turbines to name but a few. Bearing oils are used in heavy enclosed industrial gear drives containing spur, helical and bevel gears as well as spiral bevel and worm gears including those operating at high speeds or very high loads. They can also be used for chain drives, sprockets, plain and anti-friction bearings, guideways, flexible and couplings. 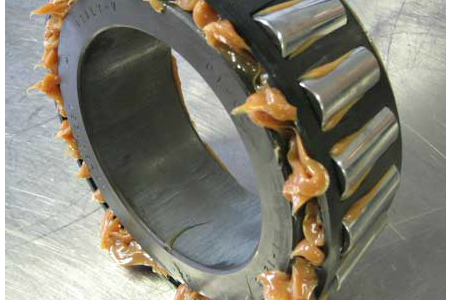 In industrial plants where service conditions require the use of an gear lubricant Midlands Lubricants Bearing Oil ML/BO68 will meets the severe requirements of all gear drives, including those of steel rolling mills, cement mill gears, cranes and mining equipment. We understand the complexity of ensuring the correct Bearing oil or curculating fluid for your application so just send us a message and our technical team will get back to you promptly.